The great Cisco Catalyst 3750 series contributes vastly success to Cisco in the network hardware market and have various models. And each model of Cisco 3750 series associates with unique product code by providing different features. How to choose the right model with right features to fit your network requirement among the different models? 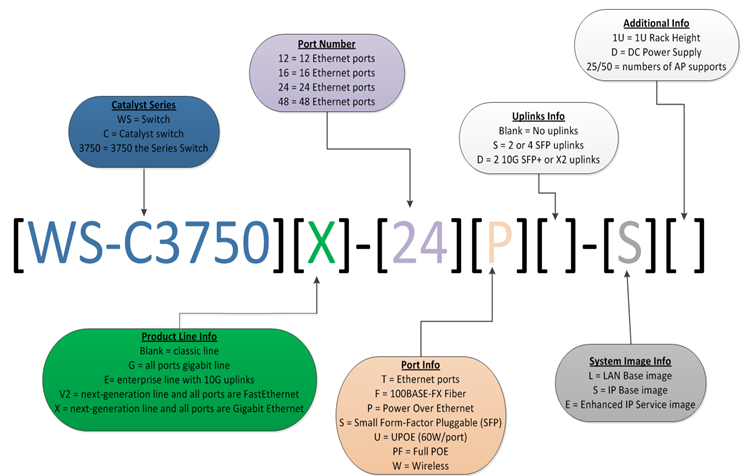 The figure below addresses 3750 series switch product code part by part to clarify the features in which the particular model of 3750 series switch can provide. Now, the Cisco 3750-X series is the more popular one. Both Cisco 3750 and 3750-X series are Campus LAN Access Switches. And the Cisco 3750 product line consists of non-blocking switches which support Jumbo frames, flow control and are easy to build up and expand a pay as you grow infrastructure. The Cisco Catalyst 3750-E and Catalyst 3750-X will run StackWise Plus when connected to a stack of all Cisco Catalyst 3750-E and Catalyst 3750-X switches, while it will run StackWise if there is one or more Cisco Catalyst 3750 in the stack.